During July 2007 the UK MoD announced the purchase of 130 new weapons-mounted patrol vehicles under an Urgent Operational Requirement for troops in Iraq and Afghanistan. The Jackal high mobility weapons platform will deliver a new level of power to the WMIK fleet, with more firepower and a better range and mobility. The vehicle can be fitted with a range of firepower including a .50 calibre machine gun or an automatic grenade launcher and a general purpose machine gun, as well as carrying a crew of four soldiers with their personal weapons. 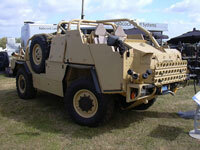 Deployed on operations in 2008 Jackal was designed by Supacat Ltd and manufactured by Devonport Management Ltd (DML) at their facility in Plymouth. Further announcements since 2007 suggest that the over Jackal fleet will reach 300 vehicles by early 2011. The Coyote is a larger version of the jackal (with six wheels) and mainly used to provide combat support and logistics. Coyote is an element in the Tactical Support Vehicle programme, the other vehicles being Husky and Wolfhound. Designed by Supacat and built by BABCOCK, approx 110 Jackal 2 Vehicles have been bought by the MoD as part of the Protected Mobility Package. With a bigger engine, an extra body length of 14 inches and an extra crew seat, this is a much better vehicle than its predecessor and is aimed at giving much more room for the troop's equipment. Speed is important for the troops in Afghanistan and with its 6.7 litre engine and top speed of 80 mph on roads and 55 mph cross country it ensures that they have a better chance of keeping up with the enemy.